A couple of months ago, innovative fashion brand Pepperberry approached me to take part in their summer style challenge. I fell in love with their collection as well as their approach to dressing women at their press day earlier on this year so of course I agreed. The challenge involved popping to a store for a consultation and personal shopping session for a summer occasion; I picked Tor from Fab Frocks’ wedding and popped to the Oxford Circus store a couple of weeks before the big day to find my perfect dress. My session started with a bra fitting, which seems a little odd but Pepperberry’s sister company is Bravissimo, so like Trinny and Susannah (remember them?!) they know that well fitting underwear form the basis of a fabulous look. With an estimated 80% of us wearing the wrong bra size, I really cannot stress the importance of being measured enough. As it turns out, I was one of the 80% who wears the wrong bra size, both my band size and cup size were completely wrong! Unlike most high street retailers, Bravissimo don’t use a tape measure, they go on the actual fit of your current bra and explain what is wrong with the current fit of your bra and how it should fit. I kid you not; it was actually like a hallelujah moment. All of my little niggles about bras were explained and it was just that I was wearing the wrong size. I’ve since gone out to buy a few bras in the right size and they all fit perfectly and are miles comfier. Now, onto the fashion! Pepperberry have a lovely selection of dresses and occasionwear dresses so I was glad to have a little help choosing. I eventually settled on a simple, tiered hemline red ombre dress as the colour is lovely and it’s versatile to wear casually with flat gladiator sandals, with courts and a blazer to work and also dressed up for weddings. I was so pleased with the dress and the fit, it was quite fitted at the bust but skimmed over the tummy and hips. The ribbon tie cinched it in at the waist and the colour was perfect for a summer wedding. The straps were a tiny bit long for me so I pinned them but the staps were thick enough to hide the pins and bra straps – Pepperberry know that there’s nothing worse than visible bra straps so all of their straps are designed to be large enough to cover them. The dress is so lovely and I’ve worn it so many times over summer. I would really recommend it, especially as it’s on sale for just £48.00. Super huge thanks to Pepperberry , especially the fantastic staff at the Oxford Circus branch. The whole shopping experience was as wonderful as their clothing range. Every single member of staff was friendly and knowledgeable. Lots of my friends and even their mums have since popped in to get measured and check out the range and have also had a fantastic experience. Such a pretty dress. It looks amazing on you. 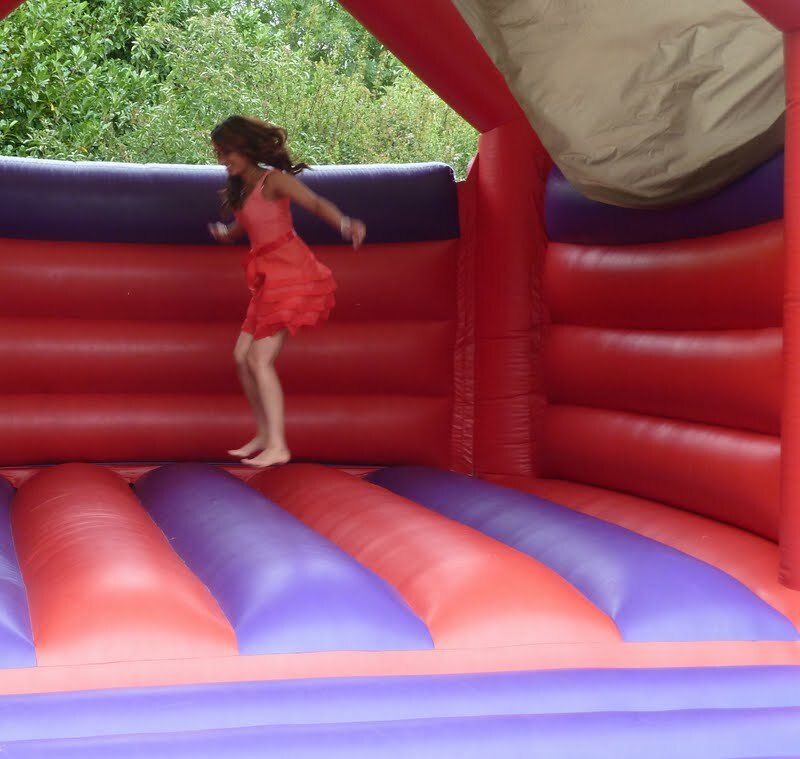 Love the dress, loved the bouncy castle too!